Hezbollah leader Sayyed Hassan Nasrallah said US President Donald Trump’s decision to formally recognise the city of al-Quds (Jerusalem) as Israel’s capital, threatens to completely wipe out the Palestinian cause and any possibility of a Palestinian state. Nasrallah also described Trump’s announcement as a ‘second Balfour Declaration’, coming 100 years after the first, when Britain declared its aim to establish “a national home for the Jewish people” in Palestine. The Hezbollah leader also said Trump’s controversial decision poses a major danger to Muslim & Christian sanctities in the holy city, particularly the al-Aqsa Mosque, one of Islam’s holiest sites. 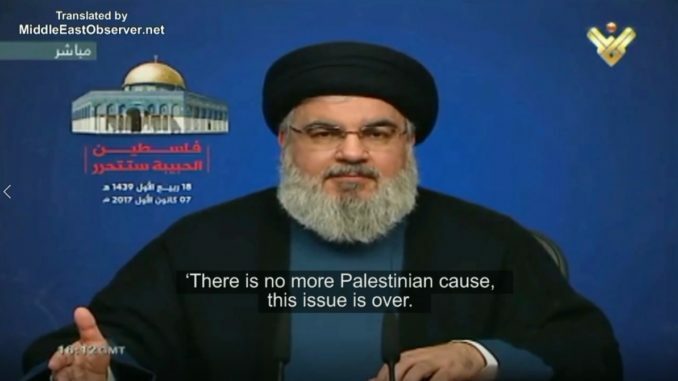 Furthermore, Nasrallah said Trump’s announcement shows his complete contempt and disregard for the will of the international community, and is an insult and attack on the feelings of hundreds of millions of Muslims and Christians around the world. The American stance use to form a barrier – in one way or another – before Israeli efforts to gain absolute control, and to fully implement the Zionist project, for al-Quds (Jerusalem). If we pay attention to this point, then we will understand the danger of this new American decision. Because what did Trump say to them? He said to them: this (city) of al-Quds (Jerusalem), all of it, (including) its western and eastern (parts), this al-Quds (Jerusalem) is yours. This is your land. This is your capital. This is under your sovereignty. Okay then, its finished, the tactical American barrier, which was related to diplomacy, and political administration of the negotiations, and the balancing of stances between the Zionist entity and Arab/Islamic states, all this fell yesterday following a fatal blow. Today, the enemy’s government (Israel), Netanyahu and his group, have no barrier before them after this American stance. We can frankly say after this announcement that the Islamic and Christian sanctities are (now) in great danger, and we must raise the alarm, yet what is in greater danger is the al-Aqsa Mosque itself – the al-Aqsa Mosque itself, which some day, no one should be surprised if we wake up and they say to us ‘there were some excavations under the al-Aqsa Mosque, and (God knows) what happened, (we were making) a tunnel or demolishing a wall, and the Mosque collapsed, it was just a mistake’. This can happen any night and at any moment. (The city) of al-Quds is the heart of the Palestinian cause, it is the centre of the Palestinian cause, the axis of the Palestinian cause, the essence of the Palestinian cause. When al-Quds is removed from this cause, then what remains? Nothing is left. What is Trump saying today to the Palestinians, the Arab and Islamic worlds, and the whole world? ‘There is no more Palestinian cause, this issue is over. (Rather), there are some people, Palestinians, some of them are present within Israel – according to his terminology – and some are present outside (of Israel), we need to find a solution for them’. ‘We need to see where we’re going to place them, maybe to Jordan, or perhaps give them Sinai, give them self-administration perhaps, what do we do with them in Gaza’, that’s the extent of the issue. As for a Palestinian cause, and the heart and essence to this cause which is al-Quds (Jerusalem), as far as America is concerned, this came to an end yesterday. Let alone the fate of a (possible) Palestinian state, an independent (state) with the holy al-Quds (Jerusalem) as its capital. Okay where is al-Quds anymore according to the Americans, so that you can negotiate – the Palestinians are unanimous, regardless of whether they demand from the river to the sea, or accept the 1967 borders permanently or temporarily, (they are unanimous) that the capital of their Palestinian state, no matter what its size, must be east al-Quds (Jerusalem). The Americans today have crossed out this issue for good. If the Americans…who were the sponsors and guarantors – meaning the sponsors of the negotiations and the guarantors of agreements if they occur – (the Americans) are saying to us all and the Palestinians, that al-Quds (Jerusalem) is not part of the negotiations. That’s it, this issue is non-negotiable, nor even the subject of discussion. We can speak about other things – if you wish to continue negotiations – we can speak about other things. However, we will not discuss al-Quds (Jerusalem). At least apparently, all world states reject this decision, and do not support it, with varying language used. Also apparently at least, all Arab and Islamic states reject this decision and do not support it. Okay, that means that the world – all world states – are saying to Trump that we reject this decision, some say ‘reject’, some say ‘we’re regretful’, some say ‘we do not support’, some say ‘we denounce’, some say ‘we condemn’, the various terms and language of each stance. Therefore (Trump) does not care about anyone, nor does he accept from anyone, nor does he respect anyone. Neither his European allies, nor his allies in the Arab and Islamic world, nor the so-called international community. If all these states are not the international community, then who is the international community? Washington? And you know that the Americans sometimes wage war on nations and governments under the pretext that they do not respect the will of the international community. Okay, where is (Trump’s) respect for the international community, his respect for the international will, and his respect for world states? What we saw yesterday is contempt and disregard for all states, capitals, and governments of the world, for the sake of Israel, which we’ll get to at the end. This is one. Furthermore, (Trump) knows, and those in his administration know, that in this decision is an insult – not just disregard – rather an insult and attack on the feelings of 1.4-1.5 billion Muslims in the world at least, and with them also hundreds of millions of Christians who do not agree with this step and feel insulted and incited (by this decision). Okay, we don’t want to add up a huge number, (at least) hundreds of millions of Muslims and Christians yesterday felt insulted, that the city they sanctify, which contains their sanctities, and their religious and civilizational identity, and which represents their long and illustrious history, was just given away, just like that, to a manufactured Zionist state, and all of this history, values, and meanings were confiscated. All forms of protest, condemnation, denouncement, outcry, and denunciation across the Arab and Islamic worlds, rather across the world, must occur in order to be heard by the American administration, and felt by the usurping entity (Israel). The cutting off of diplomatic relations with Israel, the closing of its embassies and the expulsion of its ambassadors. This is the least (a state) can do. This is al-Quds (Jerusalem), this is al-Quds (Jerusalem), meaning this is the end of the line, this is the last thing that the Arab and Islamic worlds could expect. (Furthermore), ceasing all steps (aimed at) normalisation (of ties with Israel), which have begun taking place in more than one country in the Arab and Islamic world, and particularly in the Gulf. (Steps being taken) on social media, and (mutual) visits, meetings, and (on the) media level. All this must stop. And any step (towards) normalisation today is the greatest betrayal of al-Quds (Jerusalem) after what occurred yesterday.